The whole day at the recent TEDx Copenhagen event was brilliant. I was especially thrilled that so many good people came up to me after my own talk and relayed positive feedback. It was quite humbling and inspiring. I'll have a hard time forgetting one man in particular. His name is Ole. There is an old children's song in Danish called Oles Ny Autobil / Ole's New Autocar. Ole said he enjoyed the talk but then he revealed that Copenhagenize and Cycle Chic are the direct reason that he and his family sold their Volvo station wagon. These blogs have generated an incredible amount of positive feedback over the years and it is especially when I'm giving talks abroad that I get fantastic face-to-face experiences with readers. For some reason, Ole's revelation was more moving and touching. Perhaps because I was on my home turf in Copenhagen or perhaps because Ole and I are around the same age, with kids. I don't know. Anyway, thanks to Ole for letting me know. It is incredibly humbling. And thanks to Ole for One Less Car in this city that I love so much. He has become a role model himself. 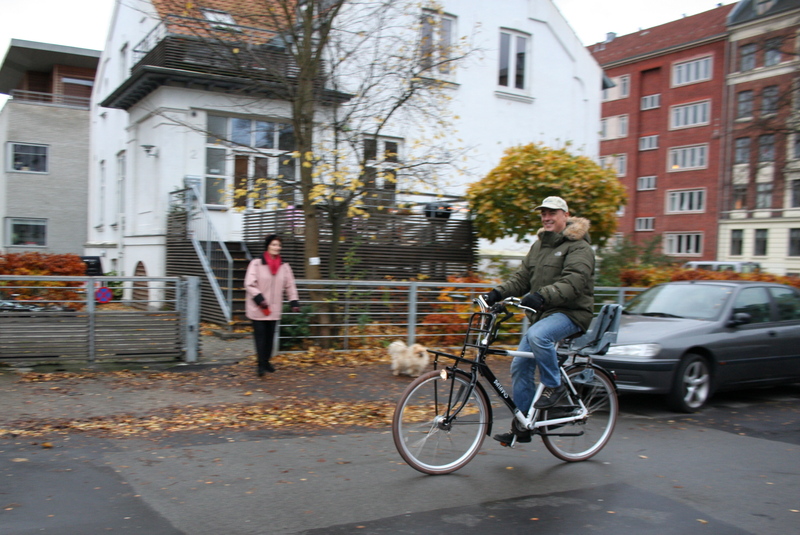 The family are no strangers to bicycles - they live in Copenhagen after all - but they took the jump and sold the old autocar. Investing instead in bicycles, including that Copenhagen classic, a cargo bike. no longer had a head. After talking with Ole I revisted an old idea. I have had many people suggest - including private citizens but also, surprisingly, several people from the Danish bicycle industry - that I start a new Danish bicycle advocacy organisation that promotes cycling positively here on the home front. I have spent some time on the idea and already have a name. It would, however, require a great deal of time and energy which I don't currently have. The idea lives on. However, if like-minded individuals came forward to share the vision and the workload, we might just get it up and running.